A cool morning with a forecast of rain resulted in a smaller turn out at the start for this year’s TT. Ken Seery’s group rolled out to Hurstbridge for coffee on the ‘peoples ride’ just before 8:30. After a short greeting and ride briefing, the rest of the riders headed out. Ben McIntyre was first back and also posted the fastest time for the day and moved into 6th overall on the Strava segment. Most riders arrived back over the next 30 minutes and then enjoyed an egg and bacon roll and coffee. A great ride from Joe Kutka in 2nd moved him into 9th overall and fastest in the 55-64yo overall. A number of PR’s were recorded which was great to see in the tricky westerly crosswind. It was great to meet some new faces and to remember Alex again both on the road and afterwards. A sad day with the first Greenwedge TT without Alex, and he wasn’t far from everyone’s thoughts as we negotiated the tricky Greenwedge TT course. It will never be the same without him and we miss you, Alex. An awesome time by Paul and the only sub 1hr 10min this year in the tricky headwinds and the 4th ever best time, with Scott and Steve equal 2nd place both just under the 1hr 15min time. Special thanks to Mike for putting on the egg and bacon muffins, awesome. Ben Walhout won narrowly from Matthew Gosbell (1 sec) The Closest victory we have seen. 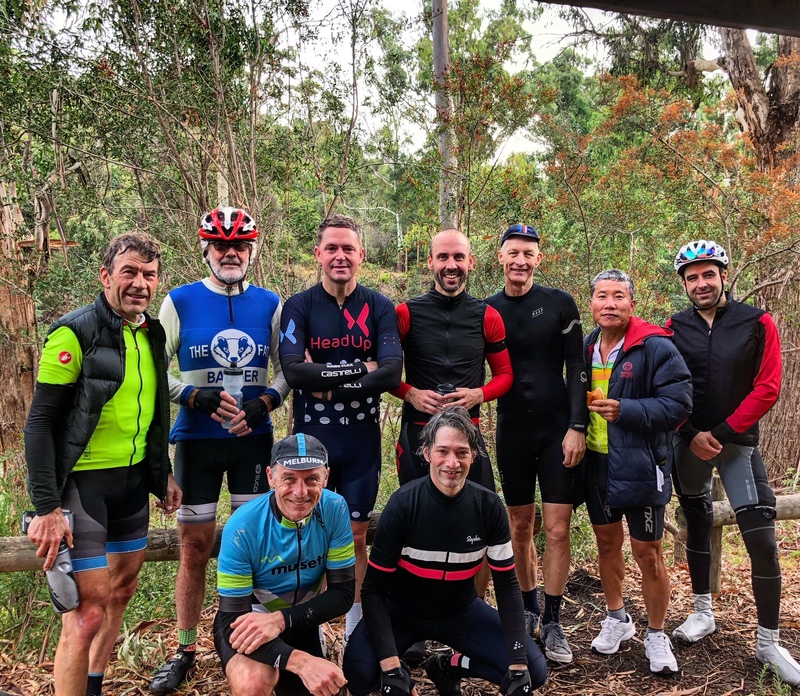 Riders met back at the Lions Park BBQ on Yarra Street near the Warrandyte Bridge for chit chat, egg and bacon rolls and water. Coffee, sausage rolls and cakes were had at the nearby Warrandyte Bakery. Summer 2015-16 has been fantastic for Victorian cycling, with the Nationals in Ballarat, Cadel’s GORR and The Sun Tour. The GreenWEDGE Cycling TT caps these off with a not-so-serious 41km ride against the clock through the Warrandyte Hills. It is a test against yourself, your ability to navigate the course and to climb and descend. The winner takes the coveted Golden Croissant and loads of Kudos. Categories are Best time for Men and for Women, Under 24 for Men and for Women, KOM and QOM on Pigeon Bank segment. The start location is the middle of the Warrandyte Bridge and the ride heads up the Kangaroo Ground Road to St Andrews, Hurstbridge and back to Warrandyte via Wattle Glen. See Strava Route map for the cue sheet. This year’s TT will be on Sunday March 13, 2016. Start and complete the course on March 13. Upload your result to Strava anytime before 11:00am that morning. The winner is the rider with the best time according to Strava. Cyclists participating are advised that they will riding on “open roads” and that all normal road rules apply including not riding more than two abreast except when another rider is passing. All riders must obey the road rules at all times, this is not a race. Traffic will be on the roads. Give way to all traffic, ride safe and enjoy. Riders meet back at the Lions Park BBQ on Yarra Street near the Warrandyte Bridge. From 10:00am, we’ll have chit chat, egg and bacon rolls and water for a gold coin donation with any surplus going to the North Warrandyte CFA. Coffee, sausage rolls and cakes are available at the nearby Warrandyte Bakery. For catering purposes please notify if you intend to do the GreenWEDGE Cycling TT here. In its fifth consecutive year The Warrandyte Cycling Time Trial is a 41km ride against the clock. It’s very not serious, and all about the fun, open to anyone who can ride a bike. Some riders include lots of coffee and donut stops on the way, others are determined to beat their time last year and many others want to finish in their best possible time with no down time. New this year will also be a KOM/QOM competition. Riders times will be judged using the rider’s Strava time uploaded before 11:45pm on the day of the ride. 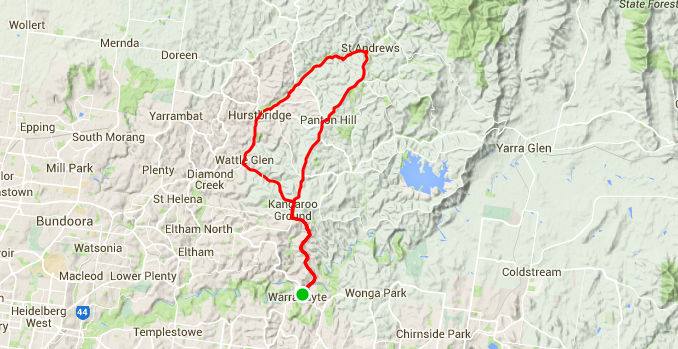 There is a standard Strava Segment for the Warrandyte Cycling TT. The current record holder is Shane Miller in a time of 1:04:50. Times will be published here the following Monday. Entry: Free, al riders must register prior to starting. Finish: to be eligible all riders must have registered and rides uploaded to Strava before 11:45AM. There will be 2 laptops at the finish so you can log in and upload at the finish. Egg and bacon rolls at $2 each available at the finish. Water available at the finish. Route: Leaving Warrandyte up to Kangaroo Ground, out to St Andrews via Panton Hill, and back via Hurstbridge and Wattle Glen returning through Kangaroo Ground and down to finish in Warrandyte. The timed point is once you have crossed the bridge and finishes again before you cross back over the bridge. The bridge, roundabout and car park are neutral both at the start and finish. 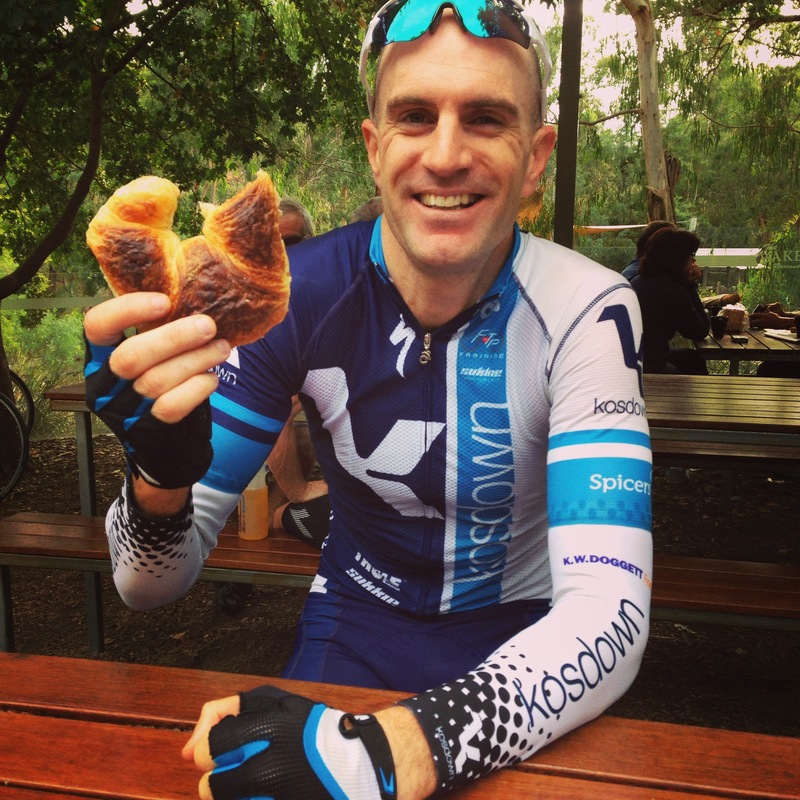 Allez Alain I love riding and racing bicycles in Melbourne’s north, where I live and where the hilly terrain plays to my strengths. Tour de Cure Tour de Cure is about riding to raise awareness and funds to cure cancer for all.